TORONTO - Longtime Progressive Conservative and former Ontario cabinet minister Elizabeth Witmer is leaving politics after being re-elected just six months ago, opening the door to a potentially game-changing byelection. Witmer is resigning as the member for Kitchener-Waterloo after 22 years in the legislature to take on the government-appointed post of chairwoman of the Workplace Safety and Insurance Board. The move could give the minority Liberals a shot at tipping the scales in their favour. The Liberals were re-elected last October just one seat short of a majority government. The election of Liberal Dave Levac as Speaker means they currently have 52 votes in the 107-seat legislature. But if the Liberals manage to snag Witmer's riding from the Tories, that would put them on equal footing with both opposition parties, who collectively hold more seats. And the Speaker, who can only vote if there's a tie, traditionally sides with the government. Shortly after Witmer announced her resignation, the government issued a release that Premier Dalton McGuinty had nominated her for the top post at WSIB, a government agency that provides workplace insurance. 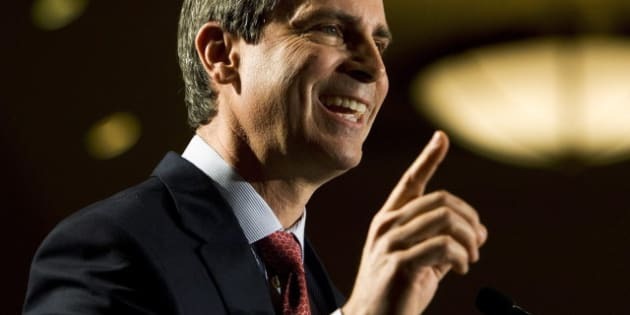 "Elizabeth Witmer is exceptionally gifted to be the chair of the WSIB," McGuinty said in a statement Friday. "Elizabeth will bring strong leadership to the WSIB board as they work to eliminate the unfunded liability while helping injured workers and reducing red tape for business." The WSIB has been a frequent target of the Tories, who have complained that the premiums it collects from businesses are killing jobs and have criticized its connections to the Liberals, including departing chairman Steve Mahoney. Witmer called her decision to leave extremely difficult, but said she felt it was the right move for her at this point in her life and career. She dismissed suggestions, however, that her choice had anything to do with the direction the party was taking under current leader Tim Hudak. "It had everything to do with me, my life and my career and what was right for me at this time," she said. "I leave the party, and it's been made easier for me because I feel it is in very good hands; I believe that we are well positioned for the future." She also shrugged off the implications of a byelection in her long-held riding because of her departure. "I don't think there's ever a right or wrong time to leave," she said. "Events happen in your life and you make decisions." Hudak, who served as Witmer's parliamentary assistant when she was health minister, said her advice and mentorship were "invaluable" and "will never be forgotten." "Elizabeth Witmer has served our province with grace, integrity and distinction and helped guide us through some very challenging times," he said in a statement. "The Ontario PC Party will forever be grateful to Elizabeth Witmer for the leadership, dedication, guidance and service she has given our party. She will always be an elder stateswoman of the Ontario PC Party. We wish her well in her new endeavour." Considered one of the more moderate Tories and well-respected by all parties, Witmer is also the longest-serving woman MPP in Ontario history. She was first elected to the legislature in 1990 and served as deputy premier in the Tory governments of Mike Harris and Ernie Eves from 1995 to 2003. She also took on several cabinet posts, including health and long-term care, education, labour and the environment, where she presided over the first closure of a coal-fired generating plant. Witmer sought the party's leadership in 2002, but lost to Eves. During the race, she vehemently opposed leadership rival Jim Flaherty's promise to make homelessness illegal and jail those who persisted in living on the streets. "I find his plan absolutely disgusting," she said at the time. "It is inhumane and is totally lacking in compassion. He has no appreciation and he has no understanding of the root causes of homelessness." Most recently, Witmer took up the fight to eliminate bullying in schools, tabling a bill which received second reading in the legislature with unanimous consent.